A GREAT opportunity to create a one of a kind Disney family memory! 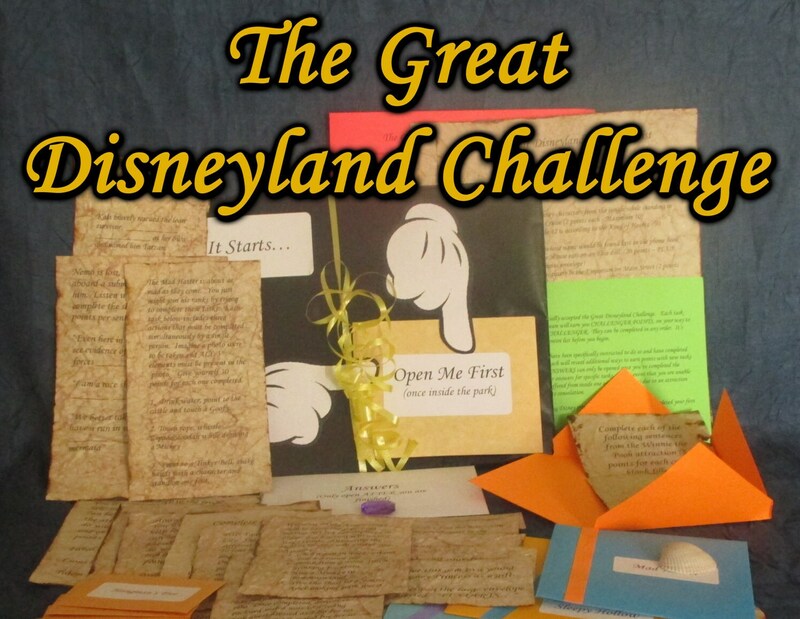 Whether it’s your first visit to Disneyland or your 1,001st (that’s right annual pass holders), The Great Disneyland Challenge was designed by a professional themed treasure hunt designer and will create a lot more fun and excitement for your stay at the Disneyland. There is NOTHING to set up! ALL of the materials arrive via US postal service in a sealed package. You’ll receive two envelopes - one small and one large. Open the small one first once you’re inside the park and YOU’RE OFF!!! A GREAT GIFT for any Disneyland fan! Although we can’t share EXACTLY what’s inside (that would ruin it for YOU, as well, and we want YOU to enjoy the fun with your family and friends) below is all the information you’ll need to get the best idea of what it is that we have in store for you. What The Great Disneyland Challenge IS and how it works? WHAT THE GREAT DISNEYLAND CHALLENGE IS AND HOW DOES IT WORK? It works off of a reward system - you get to open new bonus character envelopes with new surprises, tasks and puzzles as you progress. Many of the tasks from the list, once completed, will allow you to open one of NINE BONUS ENVELOPES, also included. Once opened, you’ll be given additional tasks pertaining to different popular Disney stories…all for a lot more BONUS points! Although we don’t want to give too much away, we can say that the list and bonus story envelopes will help answer the following questions: Who do I give the treasure gem to? What about the seashell? How many envelopes do I have to open in the Peter Pan attraction line before I find Tiger Lily? What is the frightful number, according to Ichabod Crane in Sleepy Hollow? Exactly how long can I hold ice in my hand? Even…How do I get rid of the obstacles to make my dreams come true? All these questions will be answered and more. How long does it last? As long as you’d like. Start when you like. Stop when you like. Start, stop, then start up again, if you like. As long as you keep it all in the same visit at the park (for the sake of the ranking) you’re good! This is NOT a photo scavenger hunt. Although we encourage you to take photos along the way to remember the great fun you had, that’s not what this adventure is or requiring you to do. There are several photo scavenger hunt products out there (we are soon to offer one ourselves). This adventure is unique, unlike anything you’ve ever done before because it’s from an original design. This is also NOT a bunch of random trivia. True, the more familiar you are with the park (uh-hem, annual pass holders) the easier it might be for completing many of the tasks, no prior knowledge of the Disney movies or park is required to complete the Challenge. WHO IS THE GREAT DISNEYLAND CHALLENGE FOR? Anyone. And we do mean anyone. Grandparents and grandchildren will all be able to participate and contribute in the different tasks together. Small children can help look for clues and open envelopes. Teens will have fun during some of the more daring challenges. Mature adults will enjoy it all! The Great Disneyland Challenge, you MIGHT say, was designed specifically for annual pass holders, though. As a past pass holder myself, I was always looking for ways to make my stays in the park REFRESHINGLY new. This Challenge, my fellow annual pass holders, is for you. See Disneyland with a fresh set of eyes. Cash in on all your Disneyland park experience and test yourself. Consider yourself personally CHALLENGED! During college, I worked at Disneyland (having grown up in Garden Grove, right down the street from the park) and have never stopped enjoying the magic of Disneyland. During this time I designed treasure hunts for family and friends inside the park and these hunts were a contributing factor to me starting my own design company only a few years later. Although I’ve designed hunts of all kinds that have been facilitated literally all over the world, my heart is still fondest of those original hunts I planned at Disneyland so many decades ago. This hunt (and more like them in the future) are a labor of love and I hope that you enjoy them! 3 Vampire Party Downloads - Vampire Bingo, A Vampire Party Adventure and more - for a great Vampire or Halloween Party!